Today's tip was swagger jacked from Martha Stewart online. I love hanging pictures on my wall. 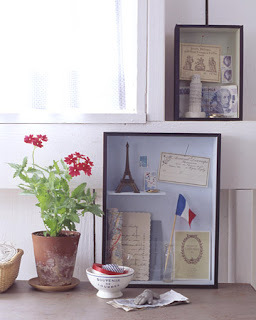 These shadow boxes with my travel souvenirs will definitely upgrade my living quarters. haha I am catching up now!!! I love this idea--a girlfriend made this awesome pic-frame with a pic from Prague with shiny decals flowers and lettering and I want to do one for Italy! Go AC MOORE!